Original oil painting on board. Overall size 17" x 13 1/2" (43cm x 35cm). Professionally framed and ready to hang. Price includes FREE UK postage. 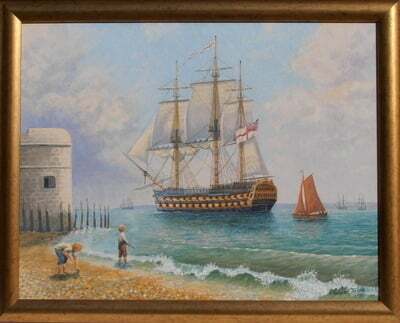 This 64-gun ship of the line is pictured leaving Portsmouth Harbour, heading for the gathering storm of war with France in the late 18th century.